Civilizations have evolved, modernized & flourished, though science & technology has given shape to lives, mankind has always been enamored with the handcrafted innovation. From Rolls Royce to the magnificent antique carpets, handcrafted creativity has been a part of the connoisseurs world. Creativity, that fabricates imagination & artisanship, has always captured the essence of Human Life. Billiards table game often denotes the gamut of cue games. Sometimes, however, "billiards table game" standing alone will refer to carom games played on a pocketless table, while billiards table games played on tables with pockets are referred to as pocket billiards or "pool". Billiards table game is a family table games played on a table, with a stick, known as a cue stick, which is used to strike balls, moving them around the table. 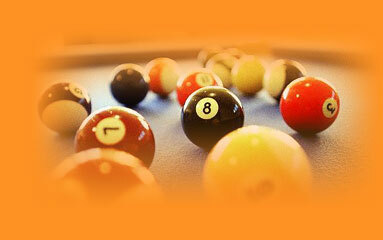 The word "pool" generally refers to pocket billiard tabel games such as 8-ball, 9-ball, straight pool and one-pocket. The word "pool" comes from "poolrooms," where people gambled off track on horse races. Inspired by the timeless antiques, we work on the true concepts of structure that articulates itself in the appeal of our billiard tables and other billiard equipments. We produce our self as leading manufacturers, dealers, exporters and suppliers of styles consistent with the prevalent antiques and follow contemporary trends to craft products that are an immaculate mélange of the traditional and the modern. Artistically transforming finish and color options into dignified dashes of individual distinction, our signature series is the embodiment of ageless beauty and impeccable style. Classically styled and meticulously crafted, the designer range, is for those with genteel and elite bend of mind and lifestyle. Not being part of the regular production schedule these masterpieces billiard tables, pool tables, home pool tables, snooker tables, steel cushion billiard tables, american pool tables are custom made & hand crafted as per the requirement of our esteemed clients. Our array of products represents the best price-quality co-relation and holds the capacity of trilling any critic. We firmly believe that our creations are a perfect blend to our customers' lifestyle and not merely a product, our handcrafted billiard tables, snooker tables manufacturer, home pool tables & pool tables dealers are not merely a statement of luxury but they define the parameters of it. An articulate blend of aesthetics & utility defines our hand crafted range of billiard tables, snooker tables & pool tables. With the conviction in human skills, age old techniques and expertise we create a fusion of modern needs and traditional craftsmanship to develop our range of Custom Made Designer billiard table/ pool tables. Billiard Table Manufacturers, based in New Delhi, India - Provides - Snooker Tables, Pool Tables, American Pool Tables, Imported Pool Tables, Home Pool Tables Carom Table Supplier, Table Tennis Tables, Sport Goods suppliers & dealers. Address:Building # 7, DDA Complex, Main Road Madangir, New Delhi - 110062. India.